Arachnophobia or a fear of spiders is one of the most common phobias in the world. Even though this is the case, comparably, there are a greater number of people who do not fear spiders, and therefore an arachnophobe needs to firstly consider why this would be? All phobias are based upon an incorrect pairing between an object (in this case spiders) and the body”s fight or flight mechanism. Phobias therefore are entirely based upon protection. So when you consider the fact that spiders, and certainly house spiders in the UK are not dangerous, and they do not attack humans, this proves that ultimately arachnophobia is a protection mechanism which is both inaccurate and unnecessary. Another fact to consider is, if spiders were so bad and a real threat to survival, then why do people who have them as pets (us included) opt for the larger venomous spiders such as Tarantulas (we have a Chilean Rose Tarantula called Pipsqueak), and the largest spider in the world being the ‘Goliath Bird Eating Spider’ (our is called Lesley). The reason for choosing spiders that could potentially bite a human is because like any pet, they do not attack! A dog could bite, but that doesn’t deter us from keeping them as pets. Spiders are no different. Healthy animals do not attack without provocation and no spider would ever attack unless it felt threatened, hence why people keep cats, dogs, spiders, snakes and rodents as if they are cared for, fed and respected they give a lot of love and pleasure. From where does your fear derive? In our private practice, we have found that spider phobias are installed generally in early childhood and usually from one of the following circumstances, which we’ve listed starting with the most common. 1. Learned Behaviour – copying a parent or loved one who you have witnessed scream and panic when seeing a spider. We learn from replicating behaviour, and certainly learn dangers from our parents such as when they shout out if as a child you try and touch a hot iron or fire. A hysterical response to a spider by an adult creates a heightened state of emotion, a fear that we must be in great danger and also the incorrect learning that spiders are to be feared. 2. Bad Experience – ironically anyone we have met that has had a bad experience with a spider has never had a bad experience caused by the spider personally, but a sibling or friend chasing them or scaring them with a spider and making them scream. 3. Illusion – nightmares or scary films featuring spiders can also cause phobias. Regrettably just as witches, zombies, bats and ghosts have been used in scary films, during Halloween and scary stories in childhood, so have spiders. However, none of the aforementioned hit our headlines or news reports as causes of mass murder or injury, none feature in government risk warning campaigns and none are used in wars to fight against people as a proficient form of attack, because it is fabricated and not fact. How can I change my belief? The first step to conquering your fear is to learn facts and educate yourself about your perceived oppressor. Evidence to help you accept you have created an incorrect learning is an important component in overcoming your fear, and always our first step when working with someone privately. It saddens us that spiders have never done anything wrong and yet are hated, feared and blamed for causing terror. • U.K. spiders DO NOT attack or bite. Even if a house spider were to feel so very petrified of you that it would try to bite, it could not pierce your skin as it’s too weak and small, and therefore you would never know. • Spiders are cowards and fear humans greatly and will always try to run away. • Spiders are virtually blind, so only see shadows, light and dark. They use vibrations to sense others. • Spiders run fast as they are prey to a multitude of animals and therefore need to get away, to protect themselves. • Spiders fear carbon dioxide (and therefore if you breathe on them they scarper in the opposite direction) as they assume you are a predator swooping down to eat them. • Spiders are non aggressive, their first line of defence is to flick hairs from their abdomen. 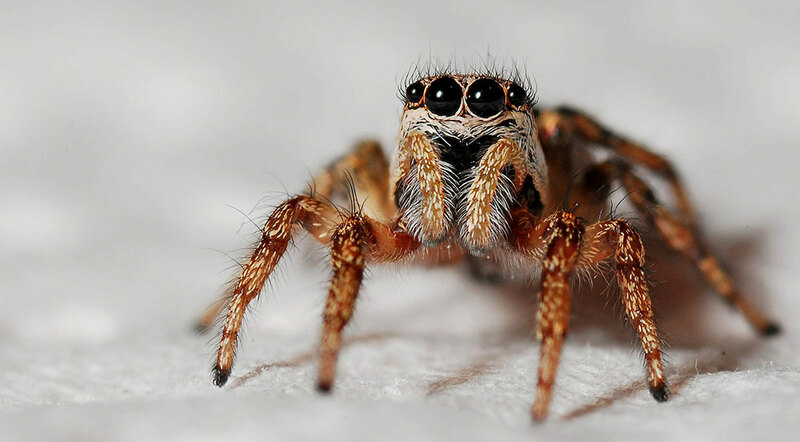 Spiders have tiny hairs which are an irritant, so if a bird were to swoop down on them they’d flick their hairs hopefully into the eyes of their aggressor. If you were about to sit on a spider unexpectedly, it would flick hairs first as it can’t see you, so senses the darkness and assumes you’re about to try and eat it. • We would potentially starve without spiders! They are our saviours as one spider will eat over 2,000 bugs and flies each year, thus stopping our crops from being destroyed or polluted by strong pest killing chemicals! • Mosquitoes have caused more deaths in the world than anything else and their number one enemy is the spider. As there are now 30 recognised types of mosquito in the UK and several with the capability of carrying malaria, spiders are once more protecting us from harm. • Spiders don’t hate you, and they definitely don’t want to be near you. They are very fearful and shy, and only come in to our homes to keep warm, find a mate and eat any flies. How can I tackle my arachnophobia? 1. If you really want to overcome your phobia, then you can once you start to accept spiders are not a real danger, and you simply misunderstood them. 2. Understand how your phobia came about, and challenge it to assist you in realising you have been blaming the wrong thing. For example, if you saw a parent screaming, realise it was the screaming parent that caused the fear in you and NOT the spider. This is a very important element as if something happened when you were a child, then you must now view it from an adults perspective. What really happened? Who really caused the problem? What did the spider really do? b) Acknowledging that pet spiders are ones that could bite but never do. d) Spiders fear carbon dioxide, so if you’re breathing they’re not coming near you unless completely by accident and then they run as fast as they can to get away from YOU. 4. If you have a pet, imagine how they would feel if you took them to a strangers house and that stranger started to scream at your pet hysterically? Your pet would be terrified and want to get away! This is what happens to spiders constantly; they come in a stranger’s house and get screamed at, so in their terror run away as fast as they can but get criticised for being ‘fast runners’! Surely it’s a bonus that they’re running away from you fast! 5. Knowing that house spiders don’t ever kill or attack humans, that they are cowards, virtually blind and terrified of people, eat bugs, flies and malaria causing mosquitoes ask yourself is it fair to victimise and blame them? 6. Finally, you may have had this bad habit for sometime so remember we’re not asking you to fall in love with spiders, all we ask is that you judge them fairly and kindly, and don’t blame them for never having done anything wrong. It would now be worth armed with this new information to slowly look at a picture of a spider for the first time as an adult, knowing that no longer being an arachnophobe will make your life much better. Hope this helps, and we’d love to hear from you and your positive feedback via twitter @The_Speakmans which we will always reply to or acknowledge.